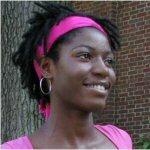 Bemene Baadom-Piaro was born in Nigeria but has resided in the United States for ten years with her family. She is a senior biology (pre-medicine) major at Berea College. She is the Vice President of the African Students Association, a member of Students in Free Enterprise, the VP of Administration for the Diversity Peer Educators, and the member of the Student Government Association. She also tutors a student from the local middle school. Bemene is interested in and takes parts in discussions about environmental justice, racial and gender equality, and class structure and classism in the United States and the world.